BOSTON, MA, MARCH 11, 2016 – The top four Incumbents selling Carrier Ethernet services in the U.S. are as follows (in rank order based on port share): AT&T, Verizon, CenturyLink, and Windstream, according to Vertical Systems Group’s latest research. These companies have achieved positions on Vertical’s 2015 U.S. Incumbent Carrier Ethernet LEADERBOARD, the benchmark for measuring Ethernet market presence based on billable retail ports delivered by Incumbent Carriers. Each company on the 2015 U.S. 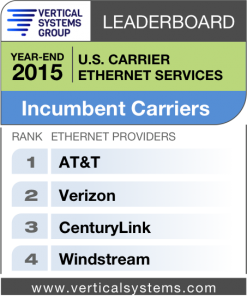 Incumbent Carrier Ethernet LEADERBOARD has achieved a rank on the 2015 U.S. Carrier Ethernet LEADERBOARD. Other companies in the Incumbent Carrier segment include the following (in alphabetical order): Cincinnati Bell, FairPoint, Frontier, Hawaiian Telecom, TDS Telecom and other incumbents selling retail Ethernet services in the U.S. market. Detailed Ethernet share results for the U.S. market and by provider segment – Incumbent Carrier, Competitive Provider, Cable MSO – plus in-depth share analysis are available now exclusively through Vertical Systems Group’s ENS (Emerging Networks Service) Research Programs. Vertical Systems Group’s LEADERBOARDs are the industry’s foremost benchmarks for measuring Ethernet Service Provider market presence based on billable retail port installations. Share results are calculated at year-end and mid-year for the U.S. and Global Provider markets. Year-end results additionally include U.S. provider share analysis for three separate segments: Incumbent Carrier, Competitive Provider, and Cable MSO. For releases and more information on methodology, see LEADERBOARDs. Vertical Systems Group’s ENS Research Programs provide a cloud-based resource with hundreds of research topics, plus analyst support for your ad hoc requests or consultations. Contact us for subscription information and pricing. Vertical Systems Group is recognized worldwide as a leading market research and strategic consulting firm specializing in defensible quantification of the networking industry. For more information see www.verticalsystems.com and follow us on Twitter for research alerts. To speak to an analyst at Vertical Systems Group, please contact us.